Now you have your delicious pomegranate seeds (see my post on 5th May) you’ll need something to go with them – something to complement them – and from here on in it gets really easy. Take an avocado: halve it and scour out the two halves. Chop it up and mix it with the pomegranate seeds. Now we’re going to give it the ultimate dressing – Kefir. What? Kefir – that’s what! One of the healthiest pro-biotic, enzyme-rich foods you can get. Kefir will balance your ‘inner ecosystem’ is more nutritious than yogurt and is packed with protein, minerals and B vitamins. You can cultivate your own Kefir, but it’s now pretty widely available – especially from Polish shops. Anyway, just pour it on – and there you are. You look after your stomach, your prostate (that comment only applies to half my readers!) your overall health and are raring to face the day. 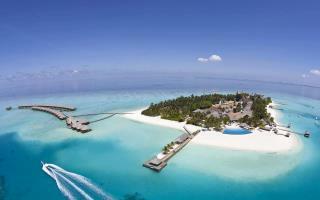 The beautiful Maldive Islands need our help ! Here’s a view of the Maldive Islands that we are all familiar with – and it’s why The Maldives are high on my list of places to visit. I want to dive there, I want to meet more of their fabulous, happy people, I want to go there. In November 2008 a general election installed a popular government led by President Mohamed Nasheed. The Maldive Islands became a nascent and much needed cradle of democracy in the Indian Ocean. A great story so far, don’t you think? Before I tell you about a fantastic organic and healthy breakfast I need to tell you how to de-seed a pomegranate – easily and completely. It goes like this: put on an apron or an old T-shirt - just in case, because you'll never get juice stains out - and cut the pomegranate into quarters, like so. and then submerge them under water in a bowl. The seeds can then be teased away from the pith with your fingers and then sink to the bottom. The bits surrounding them, with the pith, float to the surface. Take out the pith, sieve the seeds and bob’s your uncle! Fresh, juicy pomegranate seeds ready for breakfast.